The local dailies both play the home-away game in their coverage of this weekend’s Saintorama in the Eternal City. 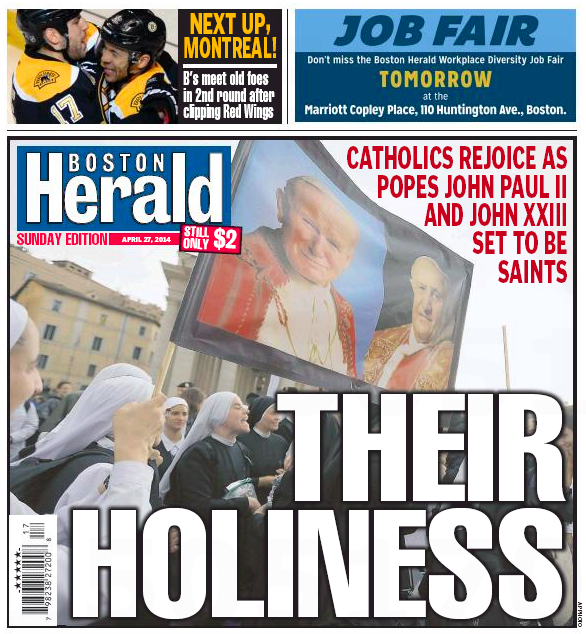 Start, naturally enough, with Page One of the Boston Herald. The faithy local tabloid follows up with four pages of Pope-O-Scope coverage, most notably former Boston Mayor/Vatican Ambassador Ray Flynn’s filing from Rome. VATICAN CITY — The great and the good have gathered in this lovely city, flocking from all corners of the world — ambassadors and cardinals, presidents, prime ministers and royalty. 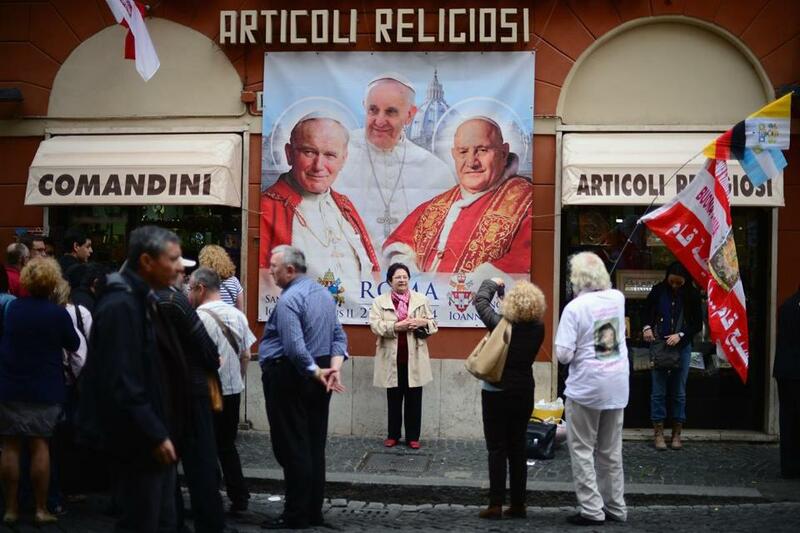 They are meeting in hotels and embassies and gorgeous residences in the Eternal City, and many gathered together for joyous reunions last night on the eve of today’s double canonization of Pope John XXIII and Pope John Paul II. It is a tribute to the remarkable occasion, the convergence of so many diverse and powerful leaders for the first time two popes will be canonized in a celebration presided over by two living popes — Pope Francis and the retired Pope Benedict XVI. But there’s an even more important constituency in town, Flynn writes. Yet there is a far greater tribute, below the glittering halls, past the motorcades and speeding police escorts and throngs of media. Down in the streets of St. Peter’s Square, thousands of humble pilgrims gathered to sleep last night. They lay on the cobblestones in the spring chill, the clouds and stars above them, waiting for the dawn, waiting for one of the great moments in our faith. There’s also Margery Eagan on John XXIII, Marty Walsh reminiscing about JP II’s 1979 Hub visit, journalist-turned deacon Greg Piatt on his vocational switch, and Peter Gelzinis on local-boy-mage-seminarian Kevin Leaver, who’ll be at the hoedown in St. Peter’s Square. 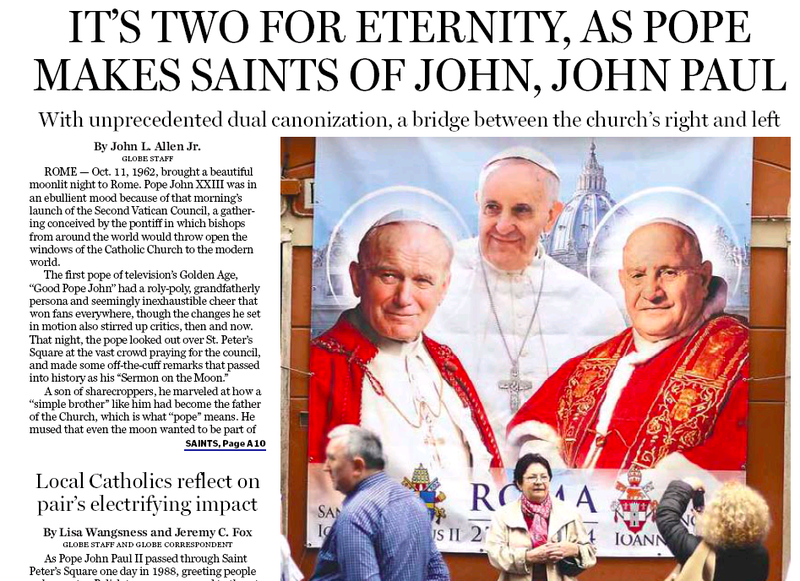 The lordly local broadsheet has Cathoholic Czar John L. Allen Jr. in Rome, while Lisa Wangsness and Jeremy C. Fox patrol the local parishes. ROME — Oct. 11, 1962, brought a beautiful moonlit night to Rome. Pope John XXIII was in an ebullient mood because of that morning’s launch of the Second Vatican Council, a gathering conceived by the pontiff in which bishops from around the world would throw open the windows of the Catholic Church to the modern world. The first pope of television’s Golden Age, “Good Pope John” had a roly-poly, grandfatherly persona and seemingly inexhaustible cheer that won fans everywhere, though the changes he set in motion also stirred up critics, then and now. That night, the pope looked out over St. Peter’s Square at the vast crowd praying for the council, and made some off-the-cuff remarks that passed into history as his “Sermon on the Moon” . 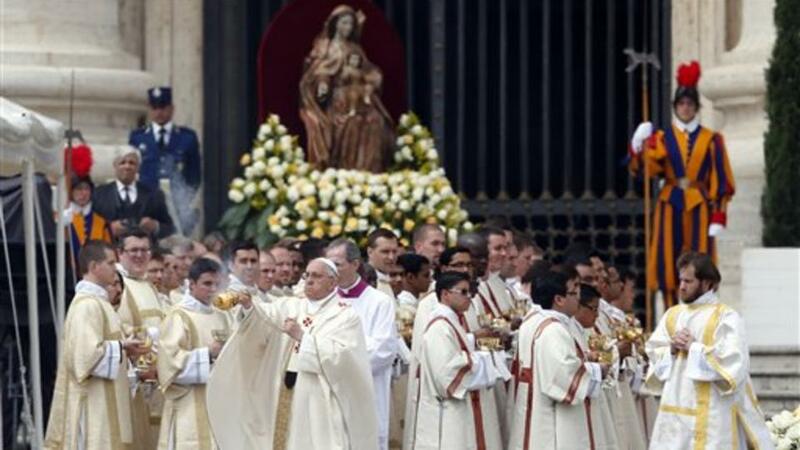 . .
No one could recall hearing a pope address the faithful in quite that way. Today’s papal twofer is unique as well.